Whether you’re looking for a leisurely bike ride or wanting to break a sweat, Beach Ride Rental Co has a variety of rental bikes to choose from. The stand up paddle board (SUP) sport has quickly become the fastest growing water sport worldwide. Choose from a variety of our rental rates below, and come and enjoy the Okanagan Lake! 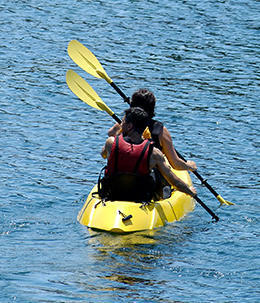 Enjoy the scenic views of Okanagan Lake from the comfort of a single or double kayak – 10ft, 12ft available for rent. 1 hour $25. Each Additional Hour $15. Deposit $500 on Extended Rentals. Single or Double Kayaks. Group rates available. When in Peachland look for Peachland Beach Rentals on the corner of 13th and Beach Ave. Rent one of our bikes, paddle boards, or kayaks to enjoy the beautiful views around Okanagan lake. Visit one of our restaurants, shop in our boutique shops or just pedal around laughing and enjoying the day. Season starts : MAY 15th Open 11 am til 5 pm. Closed for the season SEPTEMBER 15th. 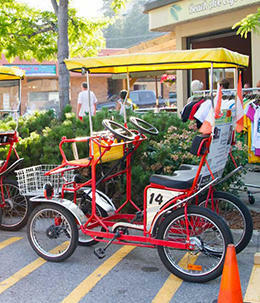 Call Peachland Beach Rentals to reserve a Canopy Bike for an evening ride down the beach walk in Peachland. 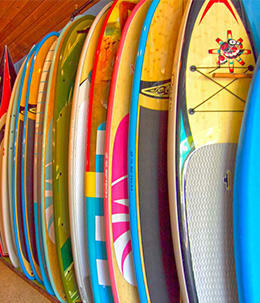 Rent SUP’s from Beach Ride Rentals, in the heart of Peachland.